I didn't watch the VMAs ... actually can't remember the last time I would have watched that, or even the last time I've looked at MTV ... but I did watch this video when it came up on a blog I read. Yowza. Not so much the song itself, although it's lovely. But her voice. No lip syncing there. Someone special is turning seven this week. SEVEN! Lately his passions have included Mario Brothers and Transformers. 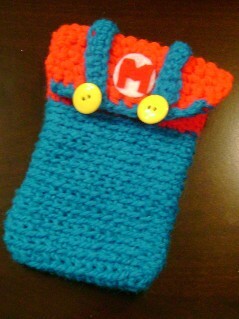 I can't crochet a Bumblebee or Megatron, but after perusing Etsy one day I found something that I COULD crochet: a Mario Nintendo DS (like a Game Boy for us olds) cover. 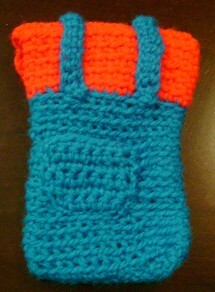 My version isn't as great as the Etsy one, but I was able to use salvaged yarn from Gran. Mine looks wonky because the blue thread is thinner than the red. I'm hoping that his DS fits (otherwise I'll have to try again -- it isn't a project that takes very long to put together). The wonky buttons and velcro look like a crazy aunt made it -- TRUE! There's one pocket in the back for a DS game or two. I really hope a certain seven year old likes it! AMLBO!!! Edit: Update! He likes it! He really likes it! Somehow I stumbled onto Momcomm -- a great blog with tips on improving your blog, including advice on affiliate marketing (i.e. getting paid whenever someone buys a product after clicking a link on your site). My favorite feature on her site is the weekly Blog Critiques -- there's always a lot to learn by reading her advice to other bloggers. And I've found some interesting new blogs to peruse at the same time. I don't think I've put much, if any, of her advice to work on my blog, mostly due to lack of interest in writing blog posts made me think why bother making the blog better? Content is king! But one thing I am going to try is affiliate marketing to promote the DIY Blog Critique e-book that Momcomm has produced. I bought the e-book myself and am reading through it, possibly to improve my own blog in some ways. If you're a blogger you might consider purchasing it too. If you do, let me know what you think. The university parking situation is ridiculous in and of itself (too many cars, not enough spots, lax monitoring, etc.). But the parking department has made it worse by not having its act together as this semester starts. We're finishing the first week of classes, our permits from last year have been expired since Aug. 14, and the department has NO NEW permits yet to distribute. I was able to get a temporary pass (because someone in my office is a nervous nelly and didn't want to take the chance at getting a ticket), although the university did send out an email (which I only saw b/c of good old Shawn) about no tickets being issued to legally parked cars in the student lots until after Labor Day. That means presumably they'll get the passes in next week/before the labor day holiday. My temporary pass is good until December, so I can wait until the traffic thins out to get my real pass. The department also tells its callers to "check our website for updates," and their site hasn't been updated in ages. Even if it has, none of the information is about parking permits -- not even the content of the mass email about no tickets until after Labor Day. Seems pretty typical for this ... place. Most of my coworkers pay $250 per year to have a parking spot closer to our building. I've just been parking in the free student lot that's across the street. Probably a 5 minute walk if I'm doing it leisurely. I was joking with one of my coworkers that Shawn didn't want me to get the closer-in pass because I need the exercise. The coworker was appalled, even though I was laughing. It's true I need the exercise (and a lot more than that), but that's not the real reason I don't spring for the pass. It's really me being cheap -- why pay for something that I can have for free? It is a little more frustrating to find a spot during really busy times (say if you need to leave for lunch and come back after). But it is what it is. I wish my employer just paid for it (especially because our rent in this building is so low), but they do not. I used the same fonts as on our wedding materials. I ordered the flat cards from VistaPrint, which came with white envelopes. I worried I ordered too many (60), but actually that has turned out to be the exact right number. VP tossed in 30 extra flat cards so I could even send some extras if I wanted/found more addresses of people who might like to be pen pals. For the return address I re-purchased the rubber stamp I had when we lived in 8G in NYC: Paperwink's Flapper stamp. I like our NYC one as a souvenir of our time there. So in preparing the moving announcements to be sent it was so satisfying to ink up my new stamp and press the design onto each envelope (after I sealed them with a wet washcloth instead of licking -- can't help but think of Susan from Seinfeld when I do a big mail batch like this). I think the ink-stamp-dry process was bringing out my latent librarian genes. Do librarians these days even need to use rubber stamps anymore, now that everything is digitized? Whatever the case, it was a lot of fun and I'm glad to have added to my stationery arsenal. I love Back to School time -- mostly the new supplies for super cheap and the promise of cooler weather to come. Give me some new No. 2 pencils and a stack of notebook paper, and I will feel very happy. But BTS isn't all roses. This week school started and the students are back ... with their cars. One of my FB friends, who happens to be a relative and live in Stillwater, wrote about students returning: "Like my Mom would say, 'I think they all bring 2 cars with them: 1 to drive and 1 to park!'" It definitely feels like it here in this college town. Shawn and I only have the one car, but we both work on campus so carpooling is fine for now. Our usual 5-8 minute commute was more like 20 yesterday. (And I know some people would be thrilled with a 20 minute commute, so it's all relative.) Today we did a little better, partly because Tuesday classes start later and partly because we took a different route. It reminds me of this blog post I read recently that had an image on it, and no matter what I try I can't find it (It was something I read via my Google Recommended Items, which don't seem to be searchable). I can find versions of it but not the image I remember. Anyway, the image was something like: You are not stuck in traffic. You ARE traffic. So all the time I sit in traffic on Highland trying to get home I try to remind myself that I am part of the reason why things are backed up. It doesn't always work. Shawn and I have made amazing progress on getting the house this weekend. We have a few finishing touches -- big and small (couch anyone?! and new drapes for the living room, etc. ), but all our boxes are unpacked. The linen closet is full of clean and fresh sheets and towels. We have empty space still in the closets, and I have a full empty drawer in my new-old-dresser that my parents brought. Am going to do my best to NOT fill it up. We'll see how successful I can be at that. One year ago I started my job. It took several months to feel comfortable doing what I was doing -- not that I was unable to do anything but more about not being able to stay busy. I still have periods of inactivity, but I definitely feel more confident and stable. Not 100% sure that I made the "right" decision between the job choices a year ago, but it is what it is. And I make more at this job than the other one offered SO it allowed us to get the house faster ... and might make it possible to get a second car that we're starting to want. Speaking of, I'll have to leave soon to pick up Shawn from the office. After all the house work yesterday he certainly needed a break (and probably some last minute class prep -- school starts tomorrow). He's such a great worker and provider. It has been one year since we rolled out of NYC to start our new life. In that time many things have changed, and we've both settled into our jobs (Shawn more than me). Now we are homeowners. We've spent the weekend shopping, unpacking and cleaning. Shawn climbed on the roofs of the out buildings to clear off some leaves and trim some trees. I cleaned kitchen cabinets, put contact paper in as many of them as I could stand, and unloaded our dishes and dry goods. We're exhausted, but making real progress. This week we'll get a furniture delivery and have a place to eat! We'll also get a new bed so that we have extra sleeping capacity. A coworker was getting rid of a twin bed that his son had grown out of, so we have that too. With the new bed we'll be able to comfortably sleep three extra, and with the air mattress two more than that. Eventually we'll get a couch that will provide a sleep solution should we be overrun with multiple family members and/or friends all at once. I'm thinking Mardi Gras time! During the shopping excursion yesterday I found something I had lost. Something I lost one year ago, and which bugged me so much. I had thought it had fallen and been left in the U-Haul. I'd thought about calling to see if they had lost and found. 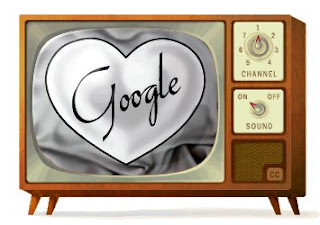 I'd googled replacements and thought about how I might make my own. I put my hand into the umbrella pocket of my Franco Sarto purse yesterday to grab my phone and lo and behold -- the missing key chain was there! It never held our Southgate keys (reminder I need to write a review of that place ... good grief), but skipped from NYC apartment to BR house. 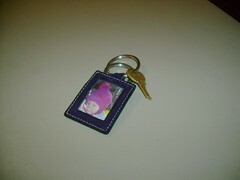 I'm really excited to have it back and smile every time I look at my keys and see the sweet face of a certain baby Owen. What's the longest you've gone between losing something and finding it? I first remember watching Lucy with my Grandma Jane. Oh how I laughed. Favorites include Vita-meata-vegi-men, the Chocolate Factory, and the one where Ricky sings "we're having a baby, my baby and me." I watched some while living in NYC, which gave the show a similar "I know where that is" vibe that I got when re-watching Seinfeld. Watch some Lucy (CBS has episodes online), eat some chocolate, get into some crazy antics, fake cry to get your husband's attention and keep on loving Lucy.